Many times a retaining wall is a requirement to protect the landscape of a property. 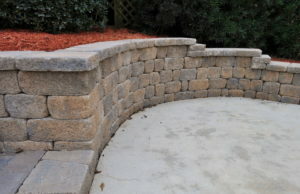 Whether you’re property needs to have drainage or flooding issues resolved, trying to prevent erosion and sinkholes, or looking to preempt damage to your property or that of your neighbors, our team of professionals has the know how to construct retaining walls that not only will stand the test of time, but we build ones that are aesthetically pleasing to your space. Function and form should always work together when talking about incorporating any kind of hardscape into your property. We can build retaining walls from pavers, stone, concrete or brick; at Dalzell Designs, we utilize creative wall plans to help hide the utilitarian need for your retaining wall beneath the aesthetic function of a beautiful design. If you’re short on space, our custom seat walls not only provide protection for your grassy areas, they also provide additional seating areas for clients, customers, or guests. This is a good example of a dual purpose landscape feature, providing added value in a single installation. Smaller retaining walls are a lot easier to plan: visually and walls under four feet don’t appear to dominate the landscape. If you’re property is in need of a larger retaining wall installation though, it’s important to have an expert in landscape design work with you to make sure that the design doesn’t distract from your home’s architecture, as well as making sure the retaining wall works with your property’s topography and drainage systems. In this same vein, using one of Dalzell ’s professional landscape architects to help design and construct your retaining wall will ensure your retaining wall will be level, well packed, and beautifully functional no matter the climate or exposure it comes up against over the years. Take a look at some of our Augusta, GA landscape designs from our gallery below for inspiration for your project by our team. We’re very fortunate as a company to have been able to grow and expand our landscaping services in the greater Augusta area over the past seven years. The city of Augusta is our company’s home, and also the life-long home of almost all of our landscaping crew members. We love the city of Augusta and are so fortunate to be able to service it’s residents with their retaining wall. From the tranquil charm of the Riverwalk, to the excitement of the Masters, we love this city. 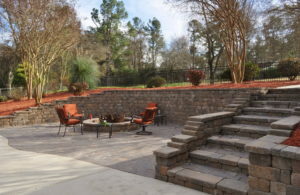 If you reside in the greater Augusta community and need help with your landscapes or building retaining walls, get in touch with the company that cares about doing the job right the first time. We’d like to show you our proficiency when it come to landscaping and to our city’s natural eco-system with our ground breaking sustainable landscape practices. Reach out today to start discussing your landscape project. Get in Touch with Our Retaining Wall Specialists Today! Call us at (803) 335 5028 or send us a message below. Dalzell Design Landscaping is a residential and commercial landscaping company serving both commercial and residential property owners in the greater Augusta, Ga and Bluffton, SC areas. We design and build creative landscapes that both beautify and bring value to properties. Our incredible results are achieved through teamwork and a constant commitment to our core values of Family, Sustainability, Creativity, and Moxie.